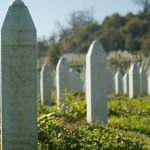 The genocide resulting in the deaths of approximately 8000 people (8372 according to the memorial stone at Srebrenica) as a result of the fall of the Srebrenica and Žepa UN safe areas in July 1995 to the Serbs during the 1992-5 war in Bosnia-Herzegovina is well known, as it was the worst atrocity in Europe since World War Two, although there are no conclusive figures yet. To date, 6,930 people have been identified, though not all have been buried yet. Football fields, schools, abandoned factories and warehouses were all used as places of execution. Subsequently many of the bodies of those killed and executed were exhumed and reburied in secondary mass graves in isolated locations over a wide area of many kilometres to avoid detection. What I propose to do in this short talk is to discuss the role of the International Criminal Tribunal for the former Yugoslavia (ICTY) in trying genocide cases concerning Srebrenica, what it has achieved to date, its limitations, some alternatives, and possible ways forward. How do these cases fit into international justice generally? There is a difference in emphasis between the historical contextual approach taken by historians who are concerned with wider issues such as the intentional role played by mass killings in determining the final outcome of a conflict and the narrower legalistic approach taken by jurists in determining whether genocide has been committed. The idea of a Greater Serbia had existed historically for a long time. In the case of the massacres at Srebrenica the historical and political background has been the same in each case tried before the ICTY which was established in 1993 to investigate the most serious violations by individuals of international humanitarian law such as crimes against humanity, violations of the laws and customs of war, and genocide. Ethnic cleansing is not a crime under the ICTY Statute. Moreover, being part of a joint criminal enterprise to murder or having superior responsibility does not require genocidal intent. The court has to establish first that the act of genocide has been committed in the sense that there is an intent to destroy, in whole or in part, a national, ethnical, racial or religious group, as such (in this case the Muslims of Eastern Bosnia) by (a) killing members of the group; (b) causing serious bodily or mental harm to members of the group; (c) deliberately inflicting on the group conditions of life calculated to bring about its physical destruction in whole or in part. The prosecution has to prove beyond reasonable doubt that those indicted knew what they were doing or the likely outcome of their acts but because of the stigma attached to a conviction for genocide the threshold is much higher requiring a specific intent to destroy the whole or part of a group in one of the ways indicated above. Although there is much academic debate about how large a group has to be and the scale of atrocities committed it is this last element which has proved so controversial both politically and legally. 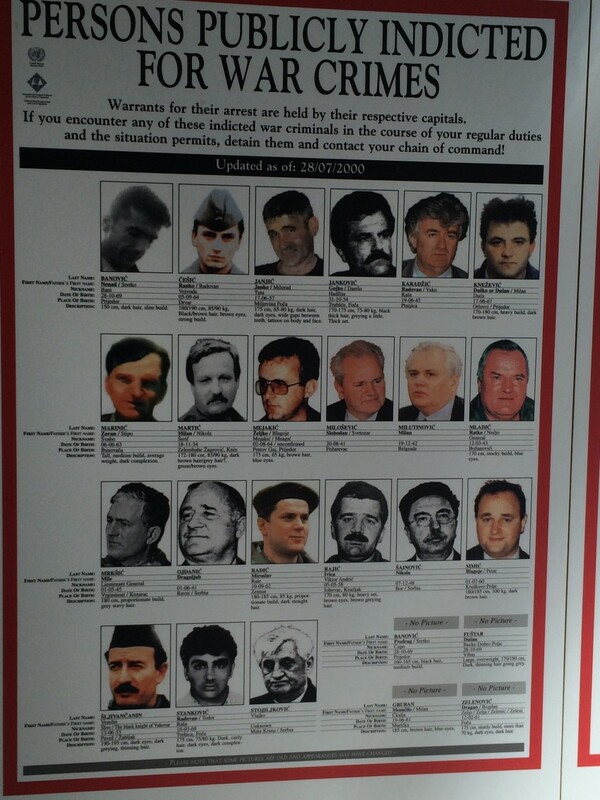 In the early years, the ICTY only convicted low-level foot soldiers and middle-level officials who followed orders, and were not necessarily intent on destroying a whole group, for other crimes while the big players such as Karadžić and Mladić remained at large. Milošević, the former president of Serbia, was indicted for genocide but died in 2006 before the completion of his trial. It was not until June 2010 that two senior Bosnian Serb military officers Ljubiša Beara, Colonel and Chief of Security of the VRS Main Staff, and Vujadin Popović, Lieutenant Colonel and Chief of Security of the Drina corps of the VRS, were found guilty of genocide during the trial of the Srebrenica Seven and their convictions upheld on appeal at the end of January 2015. Both were sentenced to life imprisonment as, unlike at Nuremburg, the death penalty is not part of the ICTY Statute. Thus for the first time two senior Bosnian Serbs had been found guilty of genocide even after an appeal hearing. This was a remarkable achievement: all earlier trials had refused to go this far, preferring to rely on crimes against humanity which do not have such a strong evidential requirement. In both cases there was no direct explicit evidence and the use of derogatory language was not determinative. On the basis of the surrounding circumstances, their words and acts and the inferences that could be drawn Beara was found to be the driving force behind the murder enterprise and had the clearest overall picture of the massive scale and scope of the killing operation. Popović participated with manifest enthusiasm in the executions at various times and places -indeed the intercept of a conversation on 17 July revealed that P gave the successful murder operation an A grade. This judgment proved to be a turning-point in the history of the court’s activities with Zdravko Tolimir, Beara’s superior and a close aide to the Bosnian Serb army commander Radko Mladić, being subsequently convicted both by the Trial Chamber in 2012 and the Appeals Chamber in April 2015, though not on a unanimous basis. Cross-references to Mladić in these cases, visible in camcorder footage at the time giving Srebrenica as a gift to the Serbian people, and further information which is coming out during his trial which undermines his alibi that he did not know and/or did nothing to prevent what was going on as well as an entry in his diaries regarding a fuel order which must have been for the use of buses and digging machines, all make his eventual conviction for genocide as the person in effective control of the whole operation more likely. Evidence from new mass graves at Tomasiča near Prijedor in North West Bosnia could also influence the outcome of his case which is still ongoing. Judgment is not expected until November 2017. Trial judgment in the Karadžić case, who was President of the Republika Srpska and Supreme Commander of its armed forces at the time was, in fact, postponed until 24 March 2016. The Court ruled that he had failed to prevent the able-bodied Bosnian Muslim men and boys from being killed or to punish those responsible and that in fact by his actions he significantly contributed to their deaths. He will undoubtedly appeal. The judgment in his case also confirmed Mladić’s essential involvement in the genocide at Srebrenica. In terms of the ICTY this marks real progress but the situation is different with regard to the International Court of Justice (ICJ) which relies on the 1948 Genocide Convention and stipulates a different and higher threshold for genocidal intent in a dispute between states, i.e. is it the only reasonable conclusion to be inferred from the pattern of conduct. In the 2007 case of Serbia v Bosnia the judgment of the Court was that Serbia was not directly responsible for the genocide and that genocidal intent could not be inferred from the consistent pattern of conduct in Bosnia and Herzegovina. Serbia was not sufficiently in control of the army of the Republika Srpska (VRS) and the Scorpion paramilitary group answerable to Belgrade was not shown to be an ‘organ’ of Serbia as defined. It is to be hoped that the ICJ will be prepared to consider an appeal within the ten-year time-limit against its original decision in 2007. In the recent case between Croatia and Serbia (3 February 2015) the ICJ similarly adopted a much higher threshold for genocidal intent than the ICTY. A similar problem exists with regard to official apologies for what happened. In principle this an alternative way (a transitional justice mechanism) for a state to admit collective responsibility for what happened but while the Serbian government after many years has apologised for what happened (partly because it wants to join the EU) though still denying genocide, this is not the case in the Republika Srpska where Milorad Dodik who has been President since 2010 is still in denial about the numbers killed. These differences between different international courts and different governments make the long-term task of reconciliation much more problematic. Genocide is no longer a taboo subject, will always remain the crime of crimes, and can happen anywhere. We all have to learn from what happened at Srebrenica to try and prevent further genocides in the future. Until now the victims have received hardly any compensation as it is left to national courts to decide upon compensation awards though there have been one or two successful cases against the Dutch government. While individual genocide convictions give public recognition to what took place, and victims have a right to be heard and speak about their suffering whether in court as a witness or in other arenas, international courts can only ever deal with the most serious cases due to limited resources. Such trials in fact serve to keep conflict alive and victims can’t move on if there is no resolution. What matters in a complex post-conflict society is the development of a sustainable rule of law as justice is the essential foundation for lasting peace. The use of regional tribunals as in Bosnia and Herzegovina, Croatia and Serbia and the emergence of the responsibility to protect doctrine in 2005 are crucial to ensuring the collective responsibility and accountability of the international community as a whole. The court archives may indeed provide a truthful record for future generations, but reconciliation is not the main purpose of the ICTY. Is it in fact possible to have reconciliation without confronting the past? Symbolic rituals and memorialization as at Potočari reflect the profound emotional legacy of genocide and respect human dignity but a sustainable future for the people of Bosnia depends as much on their own ability with the help of external funding to improve their situation for example through the provision of more and better education for future generations which could help to reduce inter-ethnic tensions and to improve their quality of life.